There are many situations where an inground pool just isn’t possible within a space; poor soil, high water table or simply building and zoning restrictions can put a stop to such plans. However, if you have been put off the thought of above ground pools as alternative because you think they look unsightly – think again. With careful design planning above ground pools with decks are more than a viable alternative. They can be a truly beautiful addition to your outdoor space. They are also much more cost effective than building an above ground pool. In this article we will dive deep (forgive the pun) into the benefits of building above ground swimming pools. We will look at what you need to consider before taking the plunge, and the realities of installing the decking. However, before we delve into all the technicalities; let’s whet your appetite with some ideas on how beautiful your above ground swimming pool with deck could look. Your family and friends are going to love you after installing one of these. Here we have a very sleek design above ground pool. The wooden decking surrounds the entire pool area, with enough space for loungers too. Note the fact the plants in the top right of the image. This helps create the ullsion the rest of the garden is of the same level as the decking. The varying height of the design is also aided by the fencing and raised steps and platform to the top left. A wonderful use of space and design. 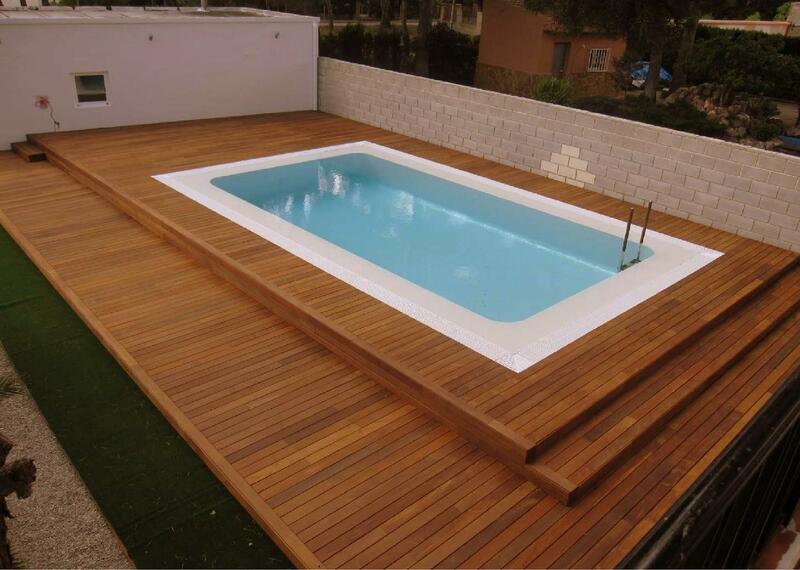 This above ground swimming pool has wooden decking that surrounds the entire structure. The simple touch of using bamboo style railings helps make the construction fit with lush surroundings. (Note the green foliage in the background – this pool is in a tropical location). This is a very important issue to consider when installing a pool. For it to really work, the design has to compliment the landscape of your space as much as possible. And if you want to install a pool slide, you need to ensure there is enough deck space available to accomodate the support structures. This wooden deck construction is of a more simple and practical design. 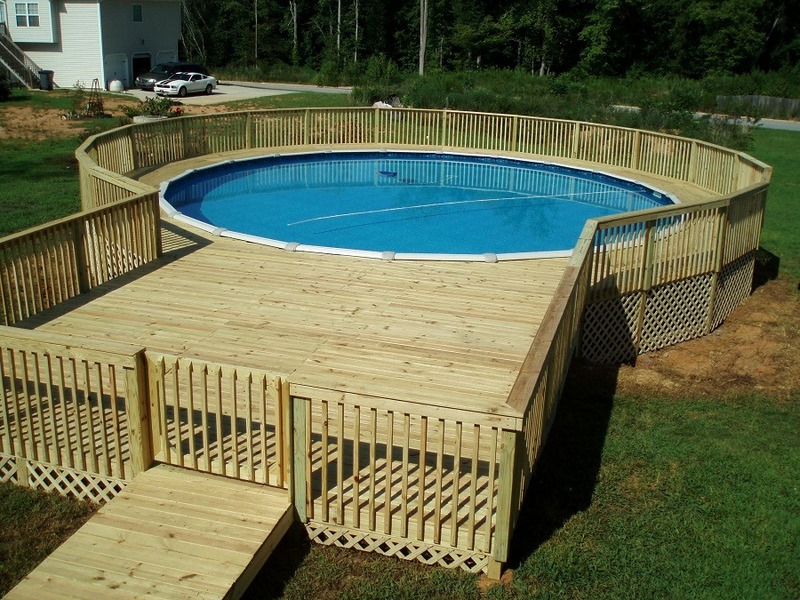 The slat wooden slides allow for access to the workings of the pool, while the fully enclosed fencing ensures everyone is safe, (you can imagine a family with children owning this type of pool). The roofed area to the rear of the pool is a nice addition too. Seating or even a BBQ could go here. This raised above ground pool build actually looks as if it flows from the first floor of the house. The wide decking area allows for entertaining and fun, (including a roofed area) with safety fencing too. Excellent for the family home. This above ground swimming pool uses a beautiful glass edge that looks extremely stylish. The small decking to the rear acts as a small entertaining area and entrance to the pool. The view from the rest of the garden looking back to the pool is obviously interesting as you can see what is going on under the water. Sleek and contemporary in equal measures. This solid looking design, takes the abruptness of shape that some above ground swimming pools can have in their surroundings by utilising wide steps up to the top level. The thin teak style decking is very attractive too. Here we have a budget, no nonsense approach to pool decking. The steps and platform provide an entrance to the pool, with enough space for a seating area too. The rest of the pool sidewalls are left exposed. This is probably the most cost effective approach to take. 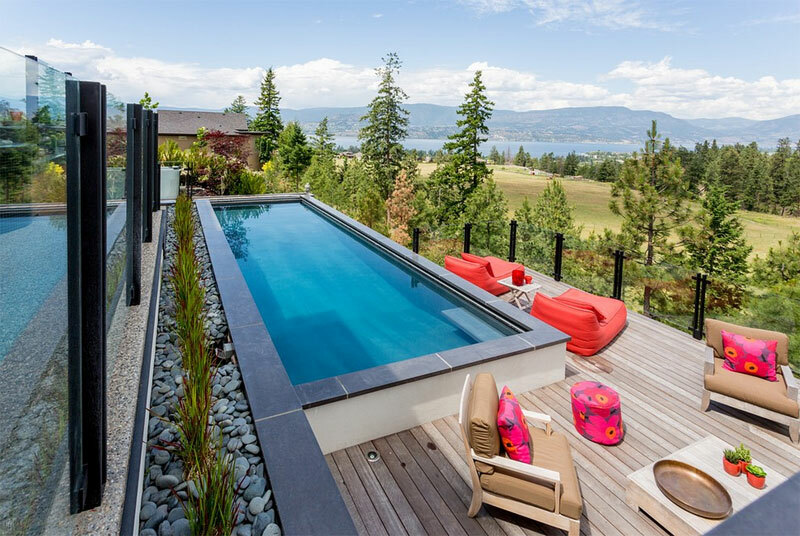 Another contemporary design with this pool. The black almost breeze block construction is offset with both wood panelling on the rear wall and then ground level decking. To the right of the image you can see a pool level platform with loungers for relaxing between stints in the pool. Another beautifully designed pool. This time the decking surrounds only two sides of the pool. However, the design allows for a very interesting infinity-pool type perspective over the sides without decking. This above ground swimming pool actually forgoes raised decking. 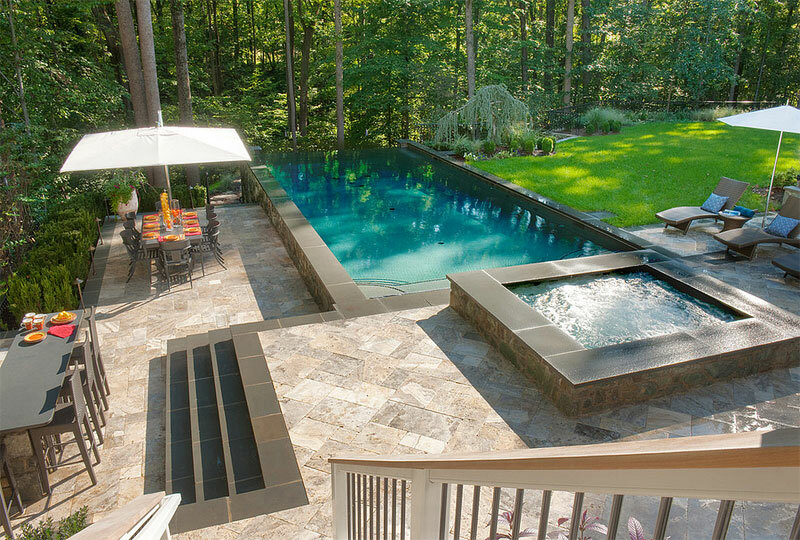 Instead, only one set of steps allow for entry into the pool, with the decking area spread out at ground level. This layout also accommodate a hot tub in the lower right side side of the image. This demonstrates that you do not always have to build raised decking for the overall effect to look great. Quality grey stone slate and brick work is used here. The overall effect is a pool construction that looks as if it has been in place for decades. An almost timeless design. The fountain edge is a great way of beautifying the hard exposed edge of the pool. Designs like this make you realise just how beautiful above ground pools can be within their landscape. This is another pool that doesn’t use raised decking. However, the solid stone surround ensures that the structure sits comfortably within the garden without looking like out of place. Here the raised pool fits seamlessly with the rest of the house. It actually looks like part of the overall construction rather than an addition. This sleek construction has an infinity edge on the rear wall. The builders have utilised the landscape to great effect, (clearly the land drops sharply to the river below, making an above ground pool a viable option in this scenario. The stone work exudes quality and adds to the overall impact of the design greatly. Who wouldn’t want a pool like this at the end of the garden? This pool benefits from the care the owners have taken to build the surroundings to the structure. The stone wall, plant beds and wood decking to the rear of the swimming pool all help to ensure that the finish is pleasing on the eye. The fact the exposed walls of the pool are fitted with wooden slats also add to the overall aesthetic. Here no decking has been used. Stone steps lead to up to a single entrance to the pool. The walls of the structure use wood panelling. A stone border with a well kept lawn keeps everything simple yet attractive. A very postmodern approach used here. 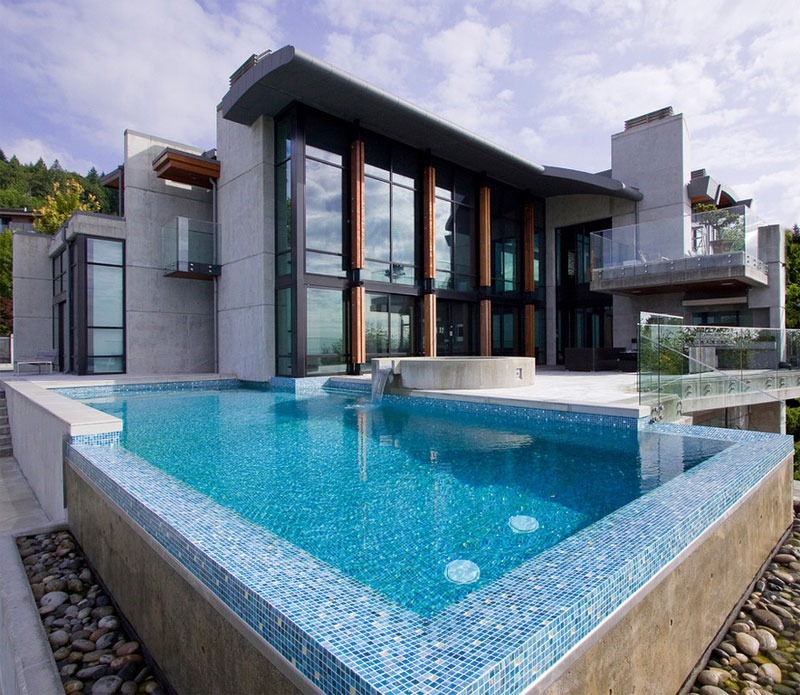 The sleek glass used on two sides of the pool set against the tiled and wood work of the rear walls is interesting. Grey stonework is used in place of decking and also provides steps up to the waters edge. Simply beautiful. The position of this pool within the surroundings really work. With the exposed edge running alongside the perimeter of the garden compensates the fact this is an above ground pool. The decking then dominates the rest of the yard, in effect making the entire garden pool and poolside area. Perfect if you have a limited area with which to play with. Clearly a design such as this is beyond most mere mortals however, it does demonstrate how sophisticated an above ground pool can look. The black edge with the water filled to the top gives the impression of glass. The pale stone work decking compliments the color scheme to great effect. A choice design for the nature of this garden being on a lower ground level to the house above. A small above ground pool solution here. Again with the pool being tucked up against a fence and a practical deck and steps construction, the overall spacial footprint of the pool is minimised. It is actually difficult to determine whether this is an above ground pool or inground. It would depend on the overall depth. However, as we can see, the different layers of the garden accommodate the pool very well here. From the lower grass area to the mid level wooden deck, and then a stone and tiled entertaining section built to the same level of the pool. A very tasteful design indeed. 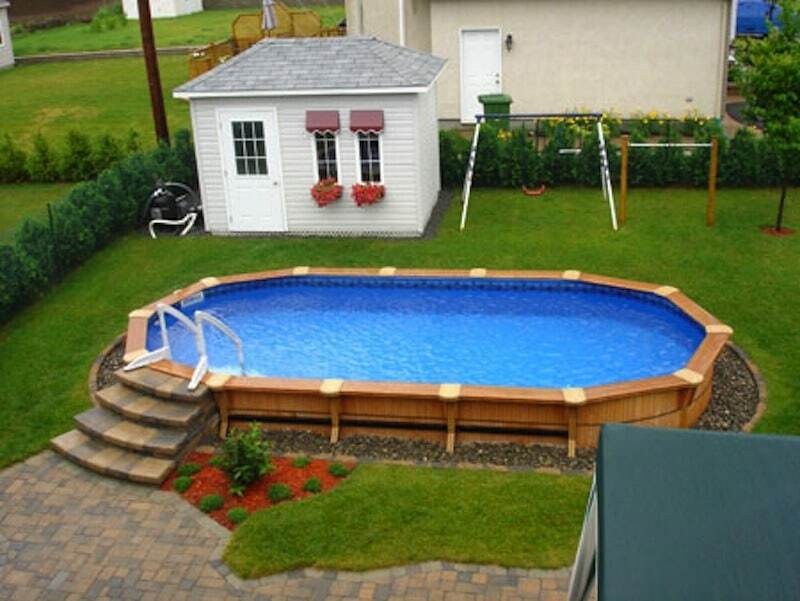 This above ground pool shows that you do not need a lot of space to have one installed. The thin rectangular shape fits against the perimeter fence and the side of the house. Small and compact, the design is extremely efficient, even allowing for a fun hot tub area at one end of the pool. This pool uses the gradient of the landscape with great effect. It is above ground construction built into the side of a sloping garden. With the backdrop of trees and a wide wood surround this really is a beautiful construction. Very well designed while being sympathetic to its environment. This design uses a large wood deck area that one assumes adjoins the back of the house. Because of this the decking serves as a main patio area of the home too. Glass and stone are used to great effect here. The wood decking is actually at ground level. The pool is in fact being used as a centre point of interest, rather than being hidden into the landscape. Wood decking also provides the entrance-way into the pool above. This simple design works very well. A large deck area to the front of the pool, and the sidewalls are hidden with the proximity against the perimeter wall. An addition of foliage and the trees encroaching behind all add to the overall aesthetic. Another infinity edge above ground pool. A raised stone platform acts as the entertaining area here. A nice touch is the how the side of the pool is turned into a water feature with the pool water cascading over the edge and into a small strip of water at ground level. The owner has made no attempt to hide the construction into the surroundings with this above ground pool. 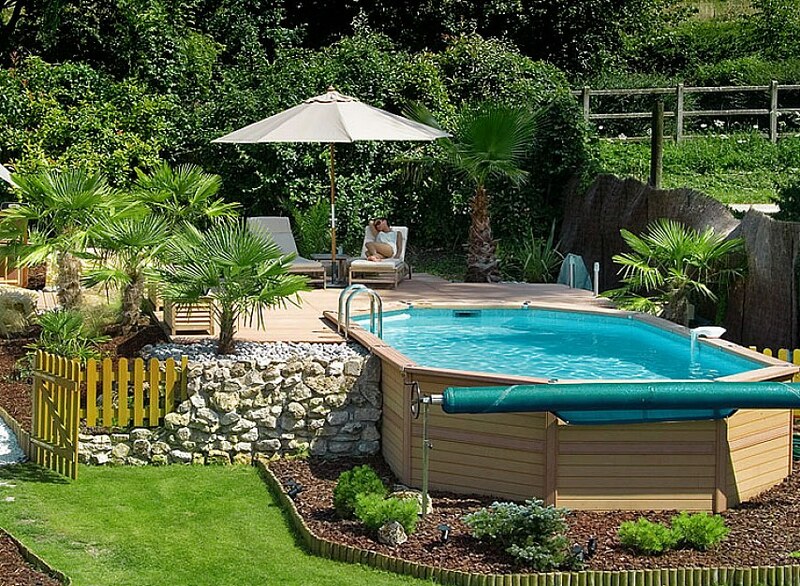 Built in the middle of a plot of land, the pool and wood decking is there for all to see. Ornate stone work has been used on this above ground pool. Built with the surrounding landscape in mind the overall effect is extremely pleasing from an aesthetic point of view. A beautiful above ground pool that fits into the surroundings extremely well. I fact one would assume that the pool was built at the same time as the house the flow of the design is that good. Above ground pools can be a real benefit for those that do not have tens of thousands of dollars to spend on a swimming pool. They are often a lot more affordable than their in ground counterparts. Having said that, as the example above demonstrates, if you do wish to spend a lot on an above ground design the finished results can be just as aesthetically pleasing as an in ground pool. If you are limited by space, above ground swimming pools with decks are a great option. The raised pool deck is a natural barrier that helps stop children and animals from ending up in the pool. The raised construction also prevents leaves and foliage from blowing into the water too. Furthermore, the raised deck doubles as an excellent storage area using the space beneath. Filtration equipment can neatly fit underneath, as can all those other garden items that do not need to be exposed all the time. If your garden has a large gradient, or maybe the soil is not suitable for an in ground pool, the above ground option will fit and install without problem. In ground pools also have the complication in that build has to withstand the surrounding earth and the what can be structure spoiling moisture. There’s also the issue of the water table. An above ground pool means you do not have to concern yourself with such details. 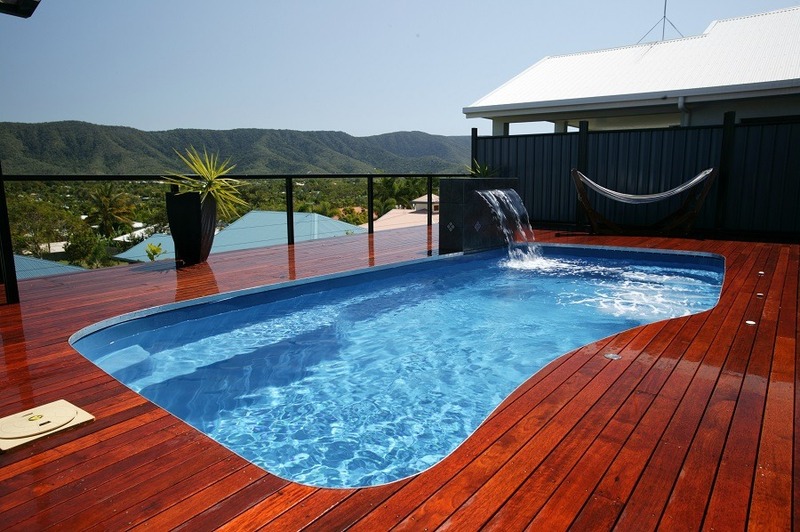 As the examples above show, an above ground pool submerged within a well designed wooden deck area can look fantastic. If your budget can stretch to one of the sleek looking stone and glass constructions, your above ground pool can really have the wow factor. Adding contrasting wood work, plants and landscaping (as well as fountains and infinity edges) ensure that above ground pools can look beautiful when done right. Whatever way you approach fitting a pool in your backyard, careful planning is definitely required. The pool will become a focal point of your property. Whether the construction connects the pool to the back of your house via decking, the position of the pool in your yard, whether the surround will be the level of the pool edge or the ground – all of these issues need to be considered. From a practical perspective you need to decide what materials to use. (A topic that can be heavily influenced by budget as well as overall aesthetic). Above ground pool decks alone can give you plenty to think about. Size, durability, heat and slip resistance are all factors. Where you live will determine design choices, do you need a large sun shade area, and do you like to entertain? Do you have children and will need comprehensive safety gates and fencing installed. All of these issues need to be considered. Let’s take a look at a few of these in greater detail. The space you have available and the function of the deck will determine the dimensions you opt for. If you have a large garden and like to entertain you will want a deck space to accommodate furniture and possible a sunshade. If your garden is small, you may only want steps leading up to the water’s edge. The size and materials of your poolside decking will have an impact on the amount of maintenance you will need to carry out. A robust stone surround to your above ground pool will be more expensive to build, but will last longer without the need of delicate maintenance. An all wood construction however, will need regular treatment to ensure moisture doesn’t begin to rot the material from the inside. With young children possibly using your pool area, you will want adequate heat resistance on the decking. The materials you use will all have different attributes in this regard. Dark bricks and Saltillo tiles can become extremely hot in direct sunlight. Teak wood on the other hand is more suitable to walking around barefoot. A popular choice beyond the traditional wood deck is concrete or stone slabs with reflective properties. These stay cooler in sunlight. They look great too. 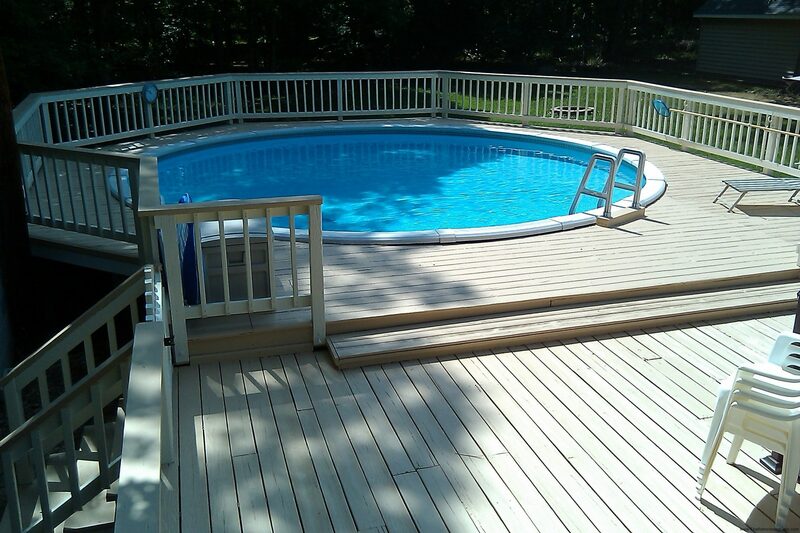 Slip resistance is a consideration you need to have when designing your pool decking. Different materials will become dangerously slippery in wet conditions. Safety should be a high priority for anyone installing a swimming pool. With above ground pools often needing stairs, a slippery surface can be a real hazard. Railings need to be in place and it can be a good idea to include slip mats in the most walked areas around the pool. As we have touched upon above, pool decks can be made from various materials that all have their pros and cons. Whether you choose tiles, wood, natural stone, bricks or limestone will largely deend on practicalities as well as the depth of your pocket. With each of these types it is best to buy the highest quality materials you can buy, (as well as a recommended builder to construct it). Let’s look at the different types of above ground pool decks available. Wood decks are the most popular choice. If you have opted for an above ground pool on a budget, the most versatile and affordable decking to opt for is the wood one. Wooden decks can be built into all manner of shapes, sizes and spaces. Wood can also be used for the safety railings, steps and gates as well as the supporting structure. Beyond cost and practicality, a wood deck done properly can look very beautiful. The construction meets the safety criteria and with regular treatment can last a long time. Cedar, cypress and teak are the most popular choices for pool decking. Some above ground pools will be sold with accompanying aluminium decking. Whether this is a small stairway and platform or full surround will depend on the product. The good thing about aluminum decks is that they are easy to install. They also withstand changing temperatures so are not prone to damage in the winter. Carpet flooring is sometimes laid on top of the construction making for a slip-proof, more comfortable surface. Stone and/or brick pool decks are the most expensive, however they are also the most durable and in many cases are the most aesthetically pleasing. Smooth bricks are recommended as they are easier to walk on. Stone slabs will last longer than bricks, (which need sealing and maintaining), however they can be extremely slippery in wet conditions. It is best to avoid stones in dark colors as they are the most heat absorbent. Poured or stamped concrete is another cost effective method of creating deck space around your above ground pool. Concrete can also be painted to meet the demands of your styling. Like stone, a smooth concrete finish can be slippery. Very often the most practical and beautiful looking above ground pools will have decking and surrounding areas made from various materials. Each can be chosen to balance the overall aesthetic, as well as provide the most heat and slippery proof surface. Whatever your design, careful planning will ensure you execute it in a way that will provide waterside fun for your family for years to come.